If today’s futuristic, Wi-Fi-enabled home devices seem familiar, it’s because we’ve seen them in TV’s past. Show of hands— how many of you grew up watching “The Jetsons?” That was television’s first stab at broadcasting the lifestyle of the typical Nuclear Family, circa 2062. It also introduced people to some technological wizardry that today’s homeowners are enthralled by. A flying car isn’t quite here yet, and automation hasn’t resulted in three-hour workdays. But there are numerous smart products that George, Jane, Judy, Elroy and Astro helped usher in or inspire during the past half century. 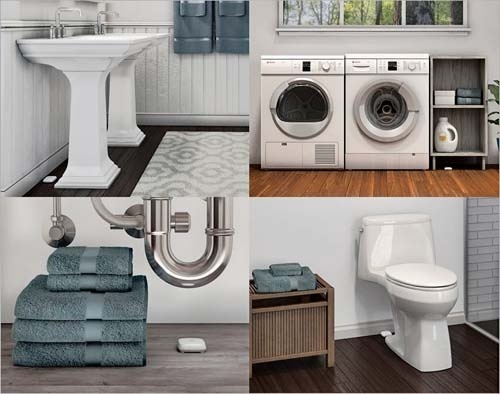 Here are 12 such products that are “must include” items in new homes and mandatory upgrades for existing housing. Nortek Security & Control’s Elan G home automation system can double as an entertainment center, thanks to its music service access. Jane Jetson’s hard day of housework—accomplished with the help of a panel of buttons for everything—has given way to the do-it-all-by-voice products found throughout the home. Amazon’s Alexa, the Google Assistant and Apple’s Siri are household names now, being able to activate those lights, locks, thermostats and appliances with a few words. Expect more of the same in the years ahead, as the number of products controlled with vocal commands spreads. Rolling along the all-purpose path is the Wink Hub 2, capable of simultaneously controlling thermostats, security cameras, door locks, lighting systems, sensors, ceiling fans, garage door openers, window blinds, doorbells and more. Compatible with iPhones and Androids, Hub 2 runs on Wi-Fi via 2.4 GHz or 5 GHz routers utilizing WPA-PSK, open security or WEP. It also works with Amazon’s Alexa voice commands and has its own If This Then That (IFTTT) web channel. The product retails for about $200. Also capable of being a jack-of-all-trades is Nortek Security & Control’s Elan G 8.0, a home automation system that manages security, climate, lights, garage doors, sprinkler systems and swimming pools, to name a few. All components are handled through a touchscreen interface that is easily shared on computer screens, televisions, tablets and mobile devices. Elan G 8.0 also acts a home entertainment master, being linked to Pandora, iHeartRadio, TuneIn, SiriusXM, Deezer, Tidal, Napster and other music and video apps. LeakSmart’s leak detection system searches for problem sites throughout the house, and makes it easy to shut the water main off when a leak is found. Just about every cartoon has a moment when a character, trying to play plumber, gets water-blasted in the face by a leaking pipe. In the real world, leaks are no laughing matter, capable of causing thousands of dollars in damage. Trying to locate the shutoff valve—and often, just getting it to move to the off position—can be a chore. That’s where LeakSmart’s LeakSmart Snap and LeakSmart Hub 3.0 come in. Snap, the valve control, easily installs on a water main and automatically calibrates the torque needed to turn off a home’s water supply. Meanwhile, sensors placed near potential trouble areas throughout the home allow the hub to detect leaks when they start. The system then shuts off the valve and sends an alert via the LeakSmart app, SMS and email that a leak has occurred, and where it took place. The system also gives a heads-up when pipes are in danger of freezing, and includes a valve shut-off reminder for when an owner is away from home for an extended period. It will also function even if the power or internet go out. LeakSmart is compatible with Control4, Nest, Google Assistant and Amazon Alexa. 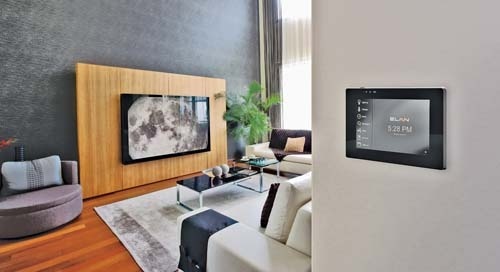 Smart thermostats such as Honeywell’s Lyric T6 Pro are making indoor environmental control a breeze (when desired). Hey, it’s cold in here—who turned off the sonic heat?” Nothing like hearing George Jetson complain about the outcome of not paying the electric bill—just like now. And that’s not the only thing from the television future that’s unchanged: Thermostats in fictional 2062 still needed a flick of the wrist to work. Not true in today’s real world, however. 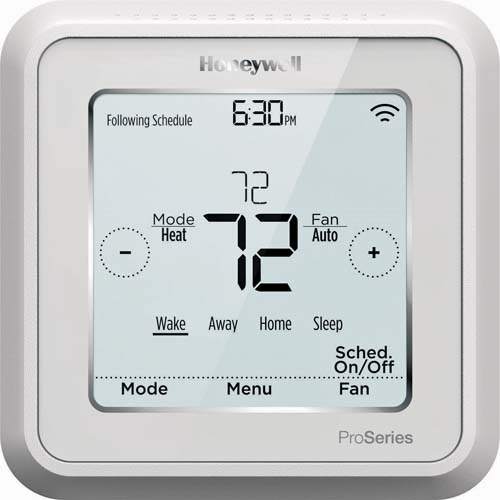 Honeywell’s Lyric T6 Pro geofencing technology lets the thermostat adjust the temperature based on a homeowner’s smartphone location. If, for example, the owner arrives home late from work or leaves the house for a few hours on the weekend, the T6 will know and switch into savings mode, maximizing energy efficiency. The unit also lets an owner manage the home’s temperature directly through smart phones, and works with nearly any HVAC system. The unit retails for about $120. Also taking an approach not foreseen by the Jetsons clan is Johnson Controls’ GLAS smart thermostat. The company reports that the product is the first to use a translucent OLED touchscreen display, monitor indoor and outdoor air quality, track energy savings and be controlled by voice. The latter feature is accomplished via its integration with Amazon Alexa, Google Assistant and Microsoft Cortana. GLAS retails for about $320. The simply designed, Zigbee-connected Zen Thermostat from Zen Ecosystems, paired with multiple service operator (MSO) smart home software, offers similar temperature control and energy saving benefits. It also, during high-demand periods, automatically adjusts temperature to reduce energy use and strain on the grid. Zen Thermostat sells for around $200. Meanwhile, Lennox’s iComfort M30 Smart Thermostat includes a “Feels Like” temperature feature, similar to a weather report. The feature takes into account indoor and outdoor temperature, and humidity to make the home feel exactly like the homeowner wants it to. The “Perfect Temp” mode allows homeowners to set the ideal temperature, and the system automatically adjusts heating and cooling to maintain that level. M30 retails for about $320. August’s Smart Lock system provides keyless access to the house, and eliminates worry over whether a door was locked before leaving home. The transparent, one-way front doors seen in later Jetsons adventures—which give a clear view of a visitor without revealing the homeowner’s presence—aren’t quite here yet. But Nest’s Hello video doorbell brings us closer. The unit has a built-in HD video camera that streams to a phone or computer, enabling an owner to see who’s ringing, even if they are nowhere near the house. A microphone and speaker allow two-way communication. Similar systems exist—such as those from Ring, August and SkyBell—but Hello one-ups competitors with the ability to scan faces and identify visitors from a database of friends or family. This capability requires a subscription to Nest’s Aware database management service. Available for about $230 to $330, Hello is compatible with Google Assistant and Alexa. Unlike the Jetsons, who for some reason still had to deal with lost keys, anyone whose homes use standard deadbolts can open and close doors with their phone. August’s Smart Lock offers keyless entry to family, friends, housekeepers and others. The product’s DoorSense technology also gives the homeowner the ability to tell if a door is closed and locked. Although the product works with the Nest system, Logitech’s Harmony, Comcast’s Xfinity Home and Apple’s Siri, it’s not compatible with every lock, and it currently only runs through iPhones. Smart Lock retails for about $230. 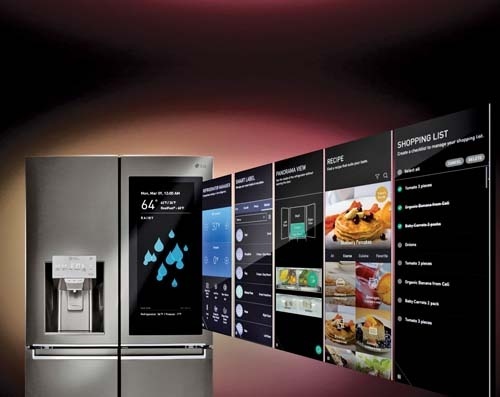 Among other things, LG’s Smart InstaView ThinQ refrigerator allows an owner to check contents through a smartphone, draft interactive messages and prepare recipes. Remember the Jetsons’ car that folded into a suitcase? Sorry, but parking spaces are still needed when you go to shop. But there’s now a machine in the works that can fold shirts on demand. The Laundroid from Seven Dreamers debuted at CES in 2017 and appeared in upgraded form at this year’s show. The Wi-Fi-driven product—jointly developed by Panasonic and Daiwa House—scans each article of clothing, then uses a catalogue of 256,000 images to determine the best way it should be handled, held up and folded by mechanical arms. Speed isn’t its forte, as it takes five to 10 minutes to fold a T-shirt. And at a price tag of $16,000, it’s not likely to be a household standard yet. But the days of accidentally burning a shirt through hand-held ironing are numbered. The Jetsons had more fun with food—real stuff, not vitamins—with the family finding ways to overeat, consume super cookies, even feed a kleptomaniacal lug nut to the family maid and robot, Rosie. One thing they didn’t have was a smart refrigerator. LG’s Smart InstaView ThinQ features a large touchscreen on the front and a camera on the inside that allows an owner to check a smartphone for food needed while they are at the grocery store. The touchscreen also serves as an interactive bulletin board for messaging, and the unit stores recipes and reads them meals are prepared. InstaView runs on Amazon’s Alexa for various digital assistant duties, and enables use of Amazon Prime to place orders items such as groceries. It can even request an Uber ride if needed.